Making Pool Days Stress Free With Sunsnap Swimwear! | For the Joy of Life. Making Pool Days Stress Free With Sunsnap Swimwear! This summer, we got passes to a local water park so Oaks can have some fun her last few months as the only child! She has been talking about going down the "wawa slides" with dada for weeks now and cannot wait for the park to open! I'm hoping this insane winter is finally coming to a close... The weather keeps tricking us though so who really knows! Once February hit, I was pretty much craving warmer weather and walks with my little family. At this point though, I'm craving dresses and sandals and dreaming of pool days. When I became a parent, I quickly learned that pool days definitely weren't quite as relaxing anymore. It also meant a whole lot more preparation to make it actually go smoothly. But what's really the hardest part about swimming with a baby/toddler? We've been lucky enough to have caught any sort of accident before it meant shutting the pool down haha, but I'm just waiting for the day Oaklyn poops in the pool. Changing diapers at the pool means taking off the entire bathing suit and trying to cover up your completely naked baby while trying to change their diaper. Then you have to try to get that wet bathing suit back on and the whole thing is just a whole lot harder than it needs to be! 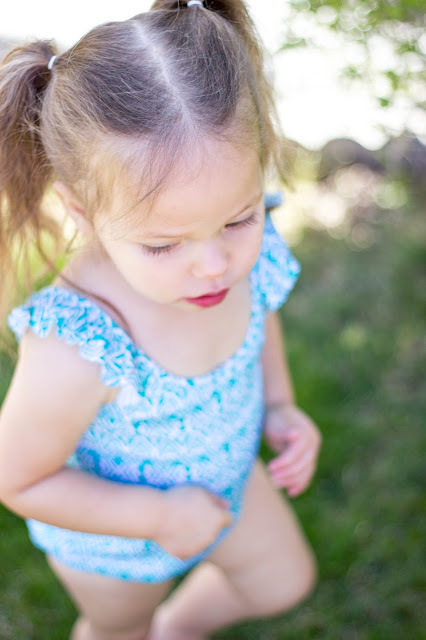 That's why I was beyond excited when we found SunSnap Swimwear! These bathing suits have snaps to make changing diapers at the pool a million times easier! They are cute, trendy, easy, and convenient so your pool day can be spent having fun without hassle! Baby onesies have snaps to make our lives easier, so why not put them on bathing suits? I don't know why more baby and toddler swimsuits don't have these because they seriously make life so much easier! 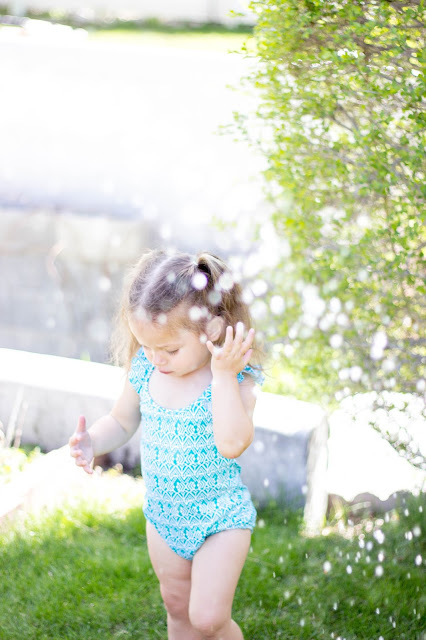 We weren't able to use this swimsuit until recently because as I mentioned earlier, the weather has been totally hit or miss with the sunshine... but we had a warm day last week and got the hose out! Oaks had so much fun running around in her suit and kept saying, "oohh mama, baby suit pwetty!" These suits come in so many cute styles, patterns, and prints so you are sure to find something you love! As a mom that is already busy and has enough to worry about, I'm so glad that this is one less thing I have to stress about! Make sure to check out SunSnap Swimwear and get a cute suit for all your summer adventures!